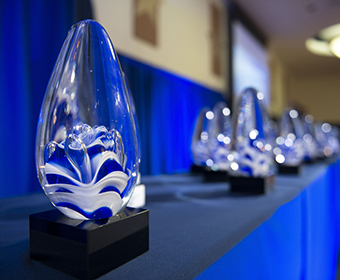 (April 16, 2018) – UTSA faculty and staff members are invited to the 2018 University Excellence Awards Ceremony at 2 p.m., Thursday, April 19 in the H-E-B Student Union Ballroom (HUC 1.104) on the Main Campus. Additionally, the ceremony will be broadcast live to the Meeting/Assembly Room (BVB 1.338) in the Buena Vista Street Building at the Downtown Campus. The ceremony will include a presentation of the University Excellence Awards, President’s Distinguished Achievement Awards, President's Distinguished Diversity Awards, Richard S. Howe Excellence Awards, and the inaugural Regents' Outstanding Employee Awards. In addition, 2017 service milestones and retirees will be recognized. President Taylor Eighmy will open the program followed by Jude Valdez, vice president for community services, who will recognize retirees and those with five or more years of service. Sam Gonzales, vice president for student affairs and Bernard Arulanandam, interim vice president for research will present the awards. Refreshments will be available immediately following the ceremony.